"Ed, I stayed up half the night reading your web site! Bravo!" You've found one of the most comprehensive telescope review websites on the internet. Inside, you'll find reviews of over 100 telescopes, eyepiece reviews, a beginner's advice column, feature articles, and lots more! If you like this site, please patronize the advertisers on these pages, they help defray bandwidth costs. DO NOT LOOK AT THE SUN THROUGH A TELESCOPE WITHOUT PROPER FILTRATION. Alphabetized & Linked List of Scope Reviews! P 7 (4) Tak Epsilon 200/FC100, Meade 102APO/500, DGM Optics 5.5"
90 mm Maksutov Comparo! Celestron's C90 and Meade's ETX Against the Questar! Which is Best: Reflector, Refractor, or Catadioptric? 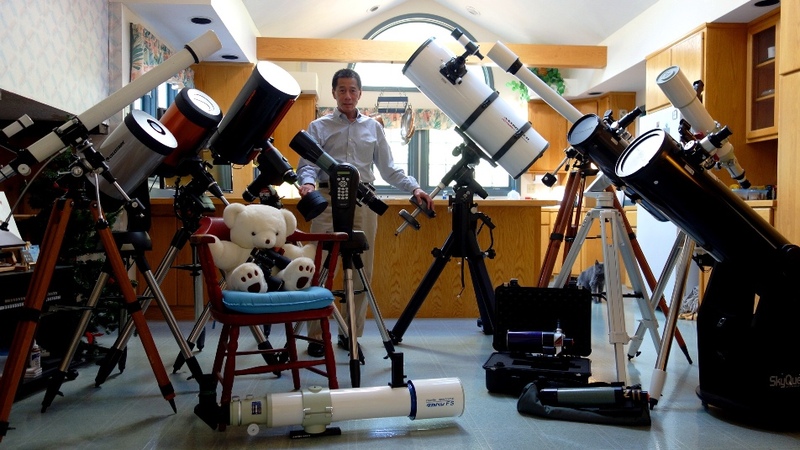 Ed Collects all the Celestron Schmidt-Cassegrains! P 5 Laser Collimator Comparo! Historical Ads from Meade, Celestron, etc. Doing a Messier Marathon...In the Fall! Tales of Astronomy 3 Will This Ever Stop!? Custom Filter Holders For Your Dob!